Canada is delivering abundant, affordable, and reliable energy to help meet the world’s energy needs in an environmentally responsible way, with a focus on reducing greenhouse gas (GHG) emissions. One of the most cost-effective ways to decrease GHG emissions is to reduce methane emissions. Our innovative projects put us on track to meet the federal and provincial governments' 45% reduction target in absolute methane emissions by 2025 (with baseline years varying slightly by jurisdiction) for the upstream crude oil and natural gas industry. Canadian Natural has a track record of investing in technology and innovation to improve our environmental performance, reduce operating costs, and become more effective and efficient. Since 2012 and before government methane reduction targets were established, we have been proactively investing in solution gas conservation as part of our heavy oil operations in Alberta. Solution gas is natural gas produced in association with oil production. Over the last five years, we have conserved more than 17.9 million tonnes of CO2 equivalent — which is comparable to removing 3.8 million passenger vehicles from the road over the same period. Deployment and efficient management of a gas conservation compressor fleet of more than 1,000 compressor units used for gas conservation. Early tie-in of multi-well pads where solution gas pipelines are installed at the time of drilling. Continuous improvements in facility design to reduce vented gas performance, including low pressure burners; recycle valve installations on compressors to improve runtime; and continuous load pumps with casing injection string to allow wells to stay in conservation mode during well loading. We continue to identify and advance innovative technologies to reduce methane emissions, including a pilot on vapour combustor technology to convert methane to CO2. (From a GHG perspective, CO2 emissions have a smaller environmental impact than methane emissions). By adding vapour combustors, we are burning excess methane gas from the casing in an enclosed unit while keeping the equipment temperature cool enough to prevent fires. 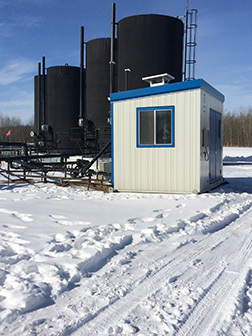 This low temperature outside of the unit allows the combustors to be installed near the wellhead, reducing the need for additional pipes and allowing for more efficient trucking, subsequently decreasing the environmental footprint on the lease. Being innovative takes more than big step changes; it also involves the way we approach our day-to-day operations. We are reviewing other initiatives that, although smaller, can be replicated across our operations. Some of these projects involve retrofitting pneumatic pumps to solar powered pumps and converting high-bleed pneumatic controllers to low-emitting ones. With investments in technology and innovation, Canadian Natural is confident that the oil and natural gas industry can continue to grow in a way that addresses GHG and methane emissions, and be an important part of a lower carbon energy future.